Rodrygo Silva de Goes aged just 17 signs for Real Madrid for somewhere in the region of €40m to €45m from Santos (the Barcelona based newspapers have the price down as €60m). More commonly known just as Rodrygo, the young player was connected to a Barcelona signing practically the whole season but Real Madrid have acted quickly and bypassed Santos through agents so as to put pressure and not succumb to the €100m Santos wanted from Barcelona. One of the most promising young players in the Brazilian league who plays as a winger and is extremely quick will join La Liga giants Real Madrid along with Vinicius Junior in 2019. Arthur is nothing like the former 2 though. 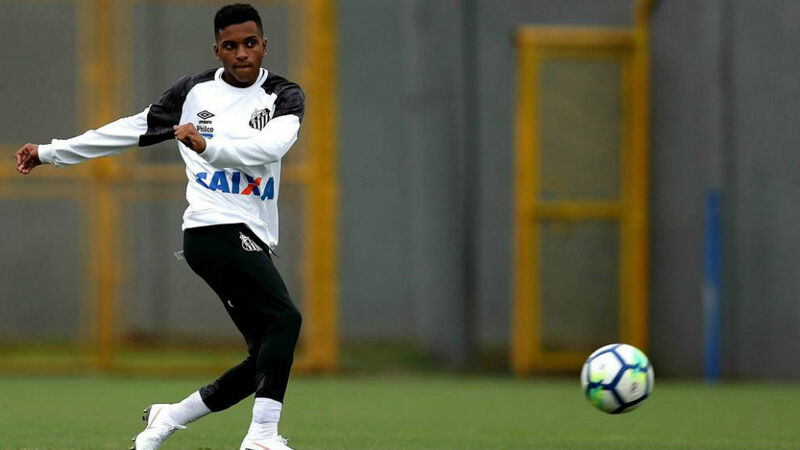 At only 17, Rodrygo is already the best Santos player. He is an amazing talent. He scored a hat-trick last weekend, gave a wonderful assist yesterday. Rodrygo is that kind of forward that you expect something special every time he has the ball. Fast, dribbles really well, good finisher. He is a natural righty, but plays on the left wing, after all he uses and shoots well with both feet. Technically, I´m totaly convinced about this kid and in my opinion, Real Madrid is doing smart business here. He´ll be a great player. Rodrygo was born in 2001, so he won´t be able to move to Europe until next year, which is good, after all what he needs now is playing time to develop. How do you compare him to Neymar? I get Neymar isn't a 10, but he could well be in 5 years. He'll be 31. On loan at Hellas Verona at 19. This is a tough question. I think Rodrygo is already a more polished finisher at 17 than Neymar was at 18, but Neymar totally dominated brazilian football in 2010. I´d say Neymar was still the better prospect, but this is by no means a knock on Rodrygo, who is a very promissing player, it´s just that Neymar was too good. I don´t like the move to Real Madrid though. This is a club with an iffy, at best, record for developing young talents. The Paulinho move to Leverkusen, in my opinion, is a better move. Having said that, Rodrygo is already really good, so this makes me a little less worried about it. This is tough to predict. So much can happen, but I´ll give it a try. Pedrinho . You've got to love Brazilian footballer names. I reckon these players would be better at a Real Sociedad or somewhere of that nature. Their record with young players is incredible and it's not like these players, if good enough in 3/4 years, couldn't then make a step up to a club like Real Madrid. It makes much more sense, although football is too much about money now, that even 17 year olds are going to the biggest of clubs, where most go on to not live up to their hype. Yago Pikachu is the best! Éverton Cebolinha (little onion) is also a strong one.